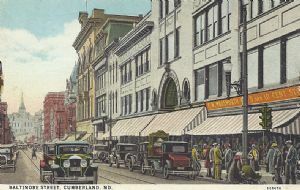 While women of Cumberland have always been active in business, no organization of business women was formed until May of 1926 when a Quota club was formed with Miss Mae Keller as president and with a membership of eighteen. This club functioned along service lines. Dr. Isabel Eiler succeeded Miss Keller as head, but the members, because of limited membership decided to affiliate with another federation in which as many of each profession as wished, might belong and in January 1928 the present group known as the Business and Professional Women's Club was formed with Miss Lillian Compton as its head. A roster of two dozen grew to a membership of more than fifty, representing at different times more than forty businesses or professions. The club sponsors scholarship loans and has many departments of work and welfare. The club's outstanding social event is the annual public relations dinner held during National Business Women's Week in March, and to which the club is now looking forward because of the expected presence of an international speaker. A state federation was formed in 1928, presidents have been Dr. Grace H. Beardsley and Mrs. Julius Freeman of Baltimore and Miss Lillian Compton and Miss Blanche White of Cumberland. Miss White is the present incumbent. The state convention will be held here in May with delegates from clubs on the eastern shore and in Baltimore. Presidents of the local club succeeding Miss Compton were Miss White, Miss Maud Bean, Miss Bessie Baird and Miss Pearle Piper. The local group is affiliated with the national body which has a membership of 60,000 in more than 13,000 clubs in 47 states, the state having no clubs being Rhode Island.